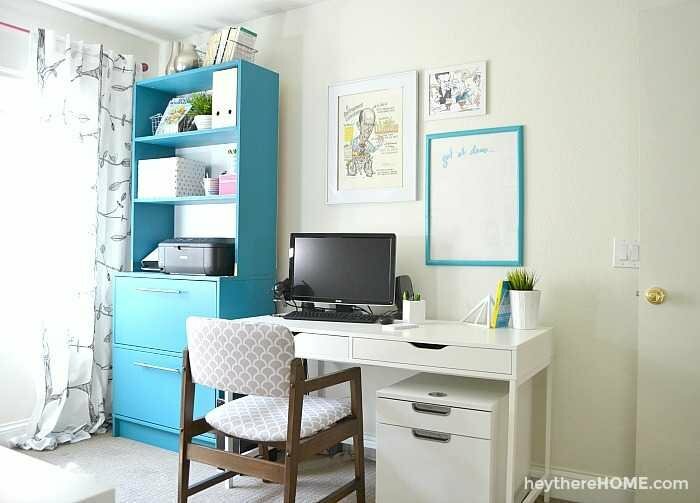 Inside: A look at the before and after of our shared office and how we completely transformed it into a shared work space that also acts as a craft room. Well it took a bit longer than I’d anticipated and I still have a few details to add, but it feels so good to say that we have turned our “heap of a mess” office into an organized, creative, bright and airy, shared office space and craft room and this girl is thrilled! I think it’s safe to say that we all have at least one space in our home that’s a catch all and needs a bit of decrapifying. 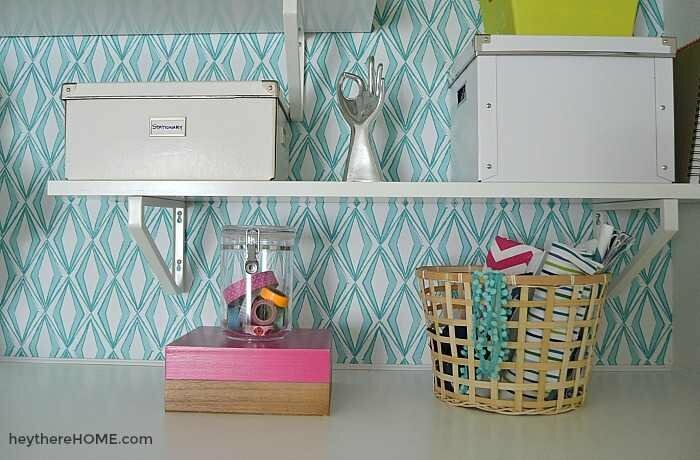 Whether it be a drawer –-I have multiple, or an entire room like we had here, taking it on one small part at a time with a proven method for decluttering has literally given us our home back, and we love it! Do you remember what this shared office looked like before? Well, let me remind you real quick cause it will make the grand tour that much better. —And make redeeming myself that much better. Crap. Everywhere. –Can’t even believe I ever worked in this space! Ok, so sorry to hurt your eyes like that. That side of the room that you just saw there, is now my husband’s desk area. And instead of seeing that when you first walk in the room you now see this! To put it nicely, my better half and I have VERY different organization styles. As in, I’m pretty organized and he isn’t. Getting on the same page is a struggle, which is why I had given up for so long, but we chipped away at all of it and we’re both really happy with the outcome. with plenty of storage and we moved the printer and scanner onto the file cabinet that I transformed with a coat of paint and by building some shelves to add to the top portion. I found these original art pieces among the crap and they are so perfect here since they have a lot of meaning. One is a cartoon poster that was created for his late father’s retirement celebration and the other is a caricature drawing of him and his closest buddies having drinks. He also has a dry erase board there to jot down to-dos as necessary. 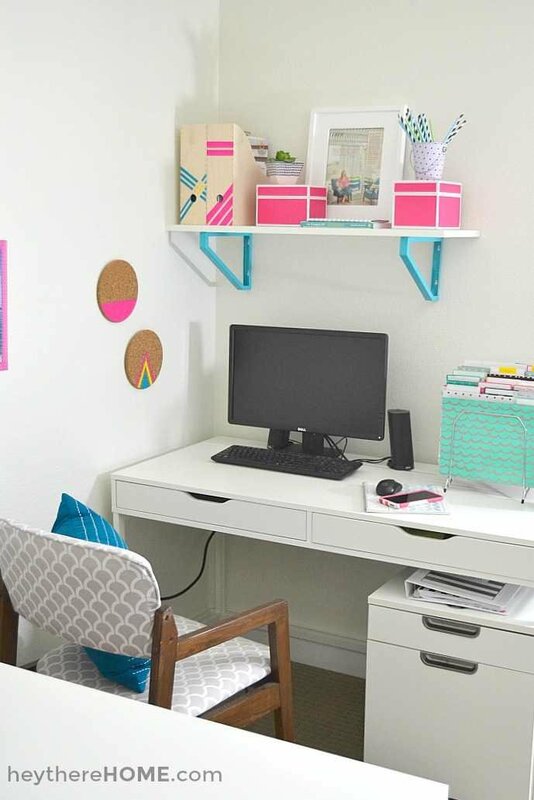 We bought the same desk and file drawers for me and I added more vertical storage with a shelf above my desk area. I have to say, it is so nice to have a really bright white work space and everything I need to brainstorm ideas, edit photos, and do my writing is right at my finger tips. I really only need to get up to refill my coffee (or wine glass) every so often during my chunks of work time. 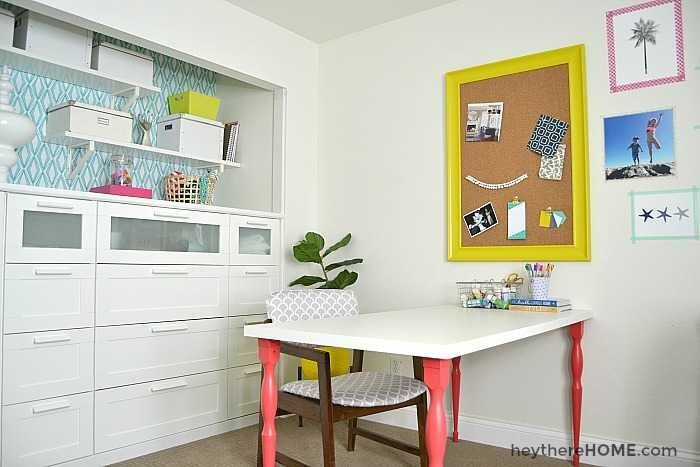 My side of our shared office space also includes a nice big work area with a large table, inspiration board that I made for almost nothing, and of course all that amazing storage that we created in the old closet with IKEA dressers. I love that the built-ins we created have a ton of hidden storage, but also has some display space. 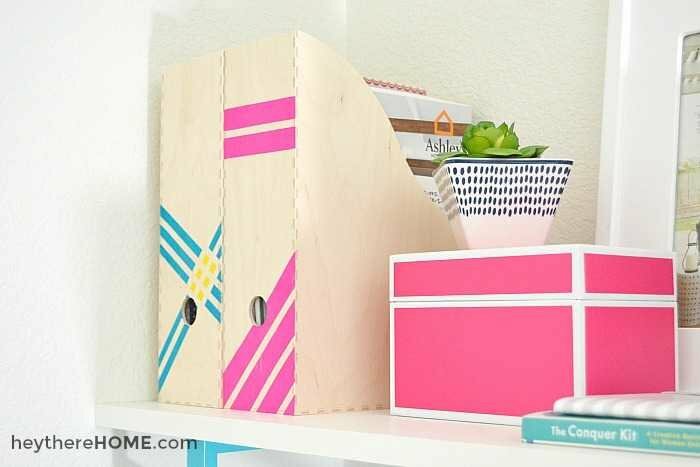 It makes the room feel open and gave me an opportunity to add some extra pops of color and pattern. Plus I love the idea of changing up the items on the shelves from time to time to get a little different look and feel in the room. Definitely a far cry from how the closet looked before right? Ok. I’m even impressed with the transformation, now that I see these before and after shots side by side! I left a good portion of the white wall empty because I often need a white backdrop for photos. This makes taking those photos a breeze, cause all I have to do is turn the table against the wall where the plant is and I have a white background. So much better than having to set up white boards all of the time! On the wall closest to my desk, I put up some fun prints that remind me of my favorite place (the beach) and the cool part is that this little gallery area can easily be changed out with the season, or as my style evolves. Getting this space in order has put my creativity and my motivation into overdrive. I’ve been able to focus on my growing business in such a better head space and I know it’s because I no longer dread walking into this room, and I can find what I need quickly. Looks like Hey There, Home Headquarters is shaping up and I’m one happy lady! Beautiful. I am going to set up my craft room soon and can not wait. Thanks, Tia! 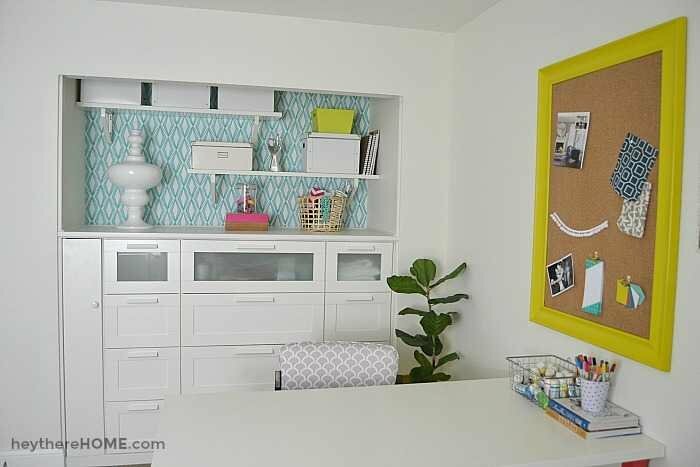 Best wishes for your craft room project! It turned out so lovely! Well done! Thanks for your time and care to make a great suggestion; I will definitely consider it, Fani! Everything turned out so great! It’s a perfect solution for sharing a space with the hubs. And I love that you have enough room for a table, too. Brilliant to keep some white wall space for pictures. Love it, lady. Love it! 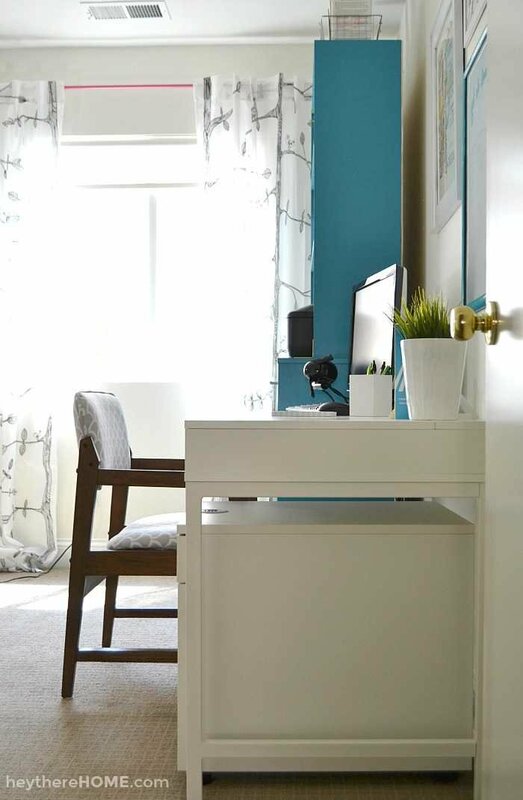 What is the teal color paint? Where did you get those brackets? I love them! And the wallpaper in the closet? 😃 Thanks! PS: the other half of my ‘office’ is in the dining room, and I have agonized for a week whether I want to move it, decorate it, or what? I like to be upstairs for my personal stuff. It is brighter and more convenient. My sewing, craft, beading business room looks just like the before, maybe worse. I love your redo. It is so calm and clean. Does it stay that way very long? I know when I am in the middle of a sewing project I trash the room every time. My beading area is in such chaos I don’t even want to do any beading, much less start up my classes for fall. 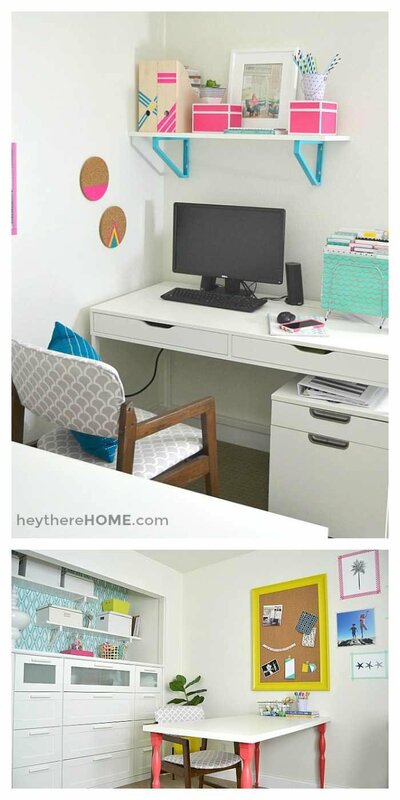 Seeing your lovely room gives me hope and an incentive to make it my next room to clean/redo. Thanks for the inspiration. I am making a copy of the room and putting up on the magnetic board. Looks great! I have at least managed to get our office space organised… But its nothing to look at yet. I just got new inspiration, thanks Corey! Very nice! 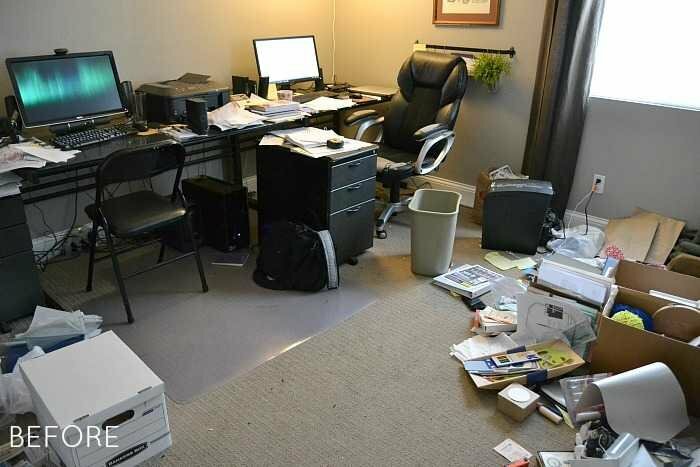 I’m working-working-working on decluttering my office to suit the new, improved arrangement I made for it, and with zillions of papers still after removing too-many-to-count bags full of no-longer-needed ones, I’m weary of it although I love the progress so far. 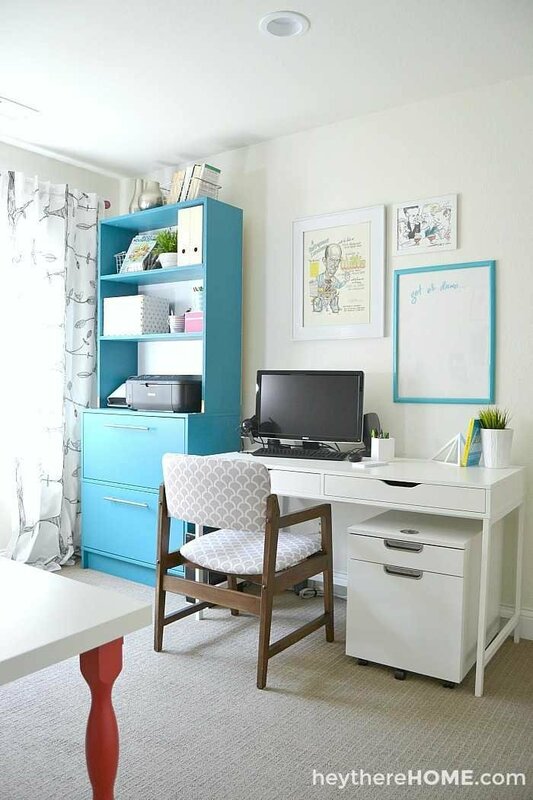 So your lovely, neat, well organized office is great motivation and encouragement that I can and will get there too. Did you really get most of the stuff in your before closet in to your after closet? Because your before closet looks a whole lot like mine does and I want it to look like your after….which is beautiful! We got rid of some things but most of it is now in the built ins or on the shelves in those containers. 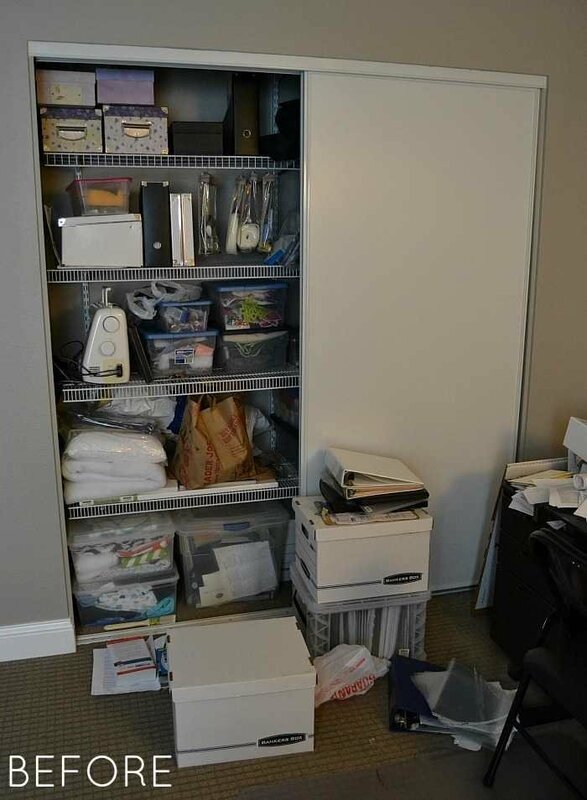 I store my sewing machine in a closet just outside of the room. It is possible!! I have tried several times to have the free project planning workbook to my email and have never received it in my inbox or my junk mail. Don’t know what happened. Donette..me too.. still not received it… I am going to try to contact Cory about it..I will also mention you .. if ok with you?? You are amazing. I’ve got the same closet but I think I’m going to look for the Ikea dressers. Right now I have their boxes but that looks so much better. Wow. 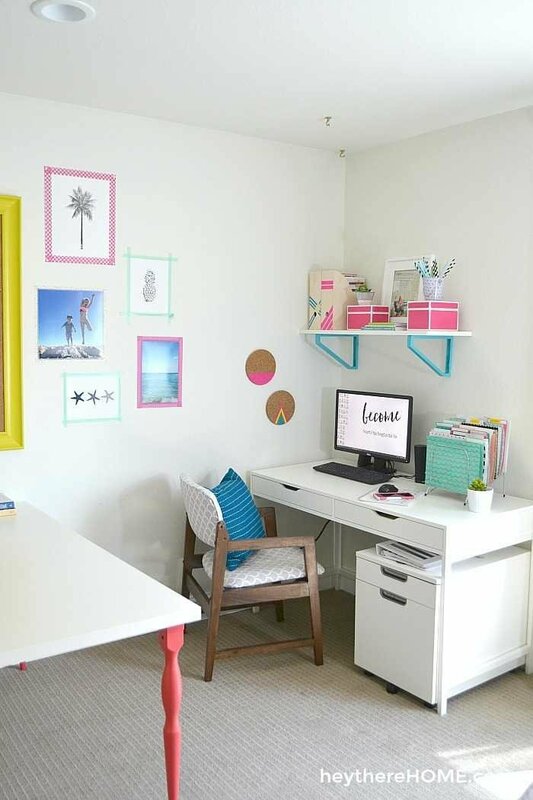 Looks tidy, bright and inviting. I used Alabaster paint color on my bedroom walls and love it. It has become my go to white. 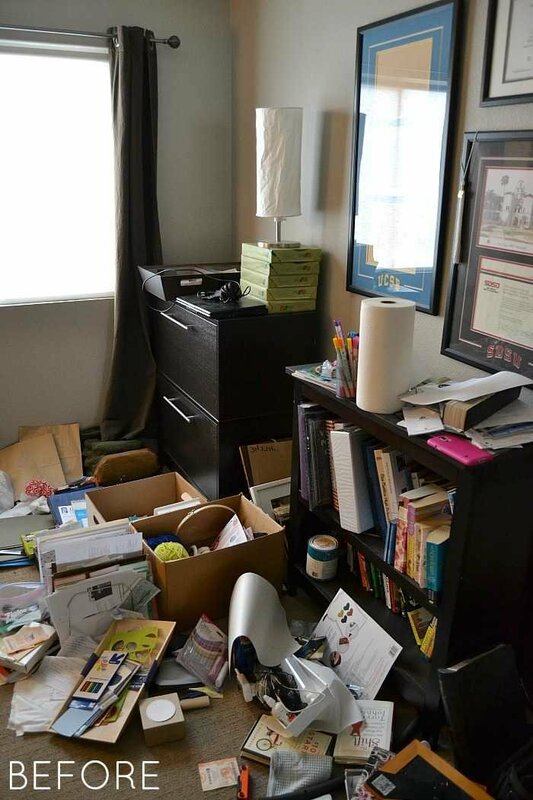 My office looks like your before photos and is next on my decluttering redo. A lot got moved there when we renovated a master bedroom suite. My deadline is two months to get it ready for a Christmas home tour. Love!! I’m tackling my office and laundry next. This just gives the proper amount of motivation! Wow, that is quite a transormation! So light, fresh and organised! Well done and thanks for sharing.